So after 5 weeks of chaos, dust, tears, angst, sweat, and “Moves Like Jagger”played on repeat at 2:00 in the morning, we have, like, 97% of a kitchen. We still have a few little projects and we also have to make the 4-hour trek to Ikea for a third time (don’t EVEN get me started. I vow to all of you here and now that if I ever do another Ikea kitchen, I will live within a 90-minute radius of Satan’s Swedish Storeroom.) I’m posting pictures next week so you guys can all take a little peek into our adventures (but only if you want to–if you don’t want to see my kitchen, we’ll provide you with plenty of alternative activities). Anyway, during our time of kitchenlessness, I had such fabulous intentions of using my slow cooker and the burner on my grill (um, am I stupid?! That never happened), but really, we just ended up eating out a lot. It sounded kind of fun at first, but honestly, it got gross. All of us were longing for a home-cooked meal, preferably one with lots of vegetables. So once we got the dust cleared out of all the nooks and crannies (literally) and I refilled the fridge, I started experimenting with stir-frying noodles and veggies (and you can also add chicken to this which was missing in this incarnation and my husband was sad). 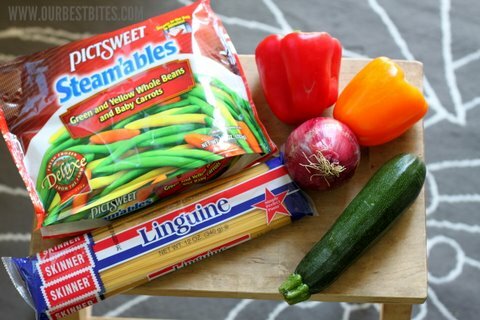 You’ll need garlic, ginger, bell peppers, zucchini, a red onion, something green and poddish (sugar snap peas, snow peas, green beans, or edamame), and noodles. I tried whole wheat and regular linguine and they were both delicious, but you could also use soba or rice noodles if you prefer them. Boil a large pot of salted water and cook the pasta according to the package directions. When the noodles are done cooking, drain them and quickly toss them in 2-3 teaspoons olive oil so they don’t stick together. While the noodles are cooking, get the sauce ready–you’ll need soy sauce, rice wine vinegar, sweet red chili sauce (Thai Kitchen has one that’s great and easy to find in the grocery store – you can also get 1 liter bottle off of Amazon, too), and brown sugar. Whisk together the sauce ingredients and set aside. If you haven’t already, prep the veggies–cut the peppers, zucchini, and onion into thin strips and mince the garlic and ginger. Heat 1-2 tablespoons of canola or peanut oil in a large skillet or wok over high heat. Add the onions, ginger, and garlic and stir fry 1-2 minutes or until fragrant. Add the peas (or beans or edamame) and stir fry for about 30 seconds. Add the zucchini and peppers and stir fry for another 30 seconds or until the veggies are crisp-tender. Add the noodles and stir fry until the noodles are well-combined with the vegetables. Give the sauce a quick whisk and then drizzle it evenly over the noodles and stir fry the entire mixture for about 30-60 seconds or until everything is well-coated in the sauce. Serve immediately. if you want, you can garnish individual servings with chopped cilantro, lime wedges, and black sesame seeds. 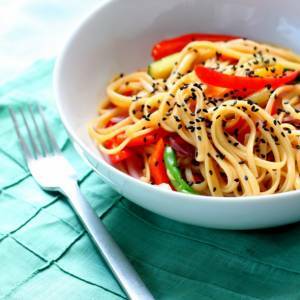 A yummy and veggie-packed meal that is a lot easier than you might think! Bring a large pot of salted water to a boil. When it is boiling, add the noodles and cook al dente. When the noodles are done, drain them and toss in 2-3 teaspoons of olive oil. Whisk together the soy sauce, brown sugar, vinegar, sweet chili sauce, and dark sesame oil. Set aside. While the noodles are cooking, heat a large skillet over high heat. When the oil is hot, add the sliced onions, garlic, and ginger. Stir fry 1-2 minutes or until fragrant, but the garlic isn’t burning. Add the peas (or beans or edamame) and stir fry for about 30 seconds. 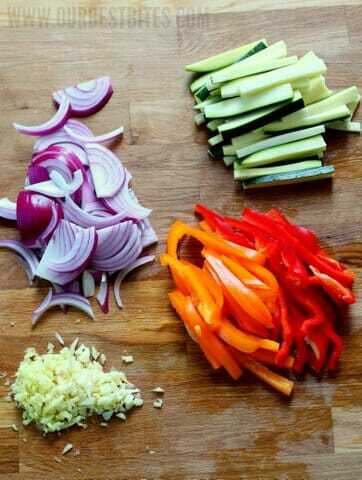 Add the zucchini and peppers and stir fry for another 30 seconds or until the veggies are crisp-tender. 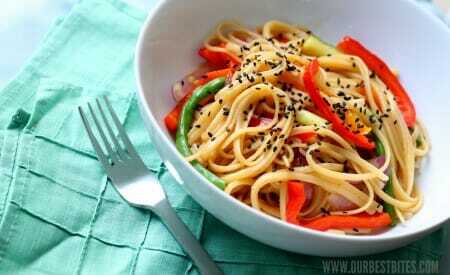 Add the noodles and stir fry until the noodles are well-combined with the vegetables. Give the sauce a quick whisk and then drizzle it evenly over the noodles and stir fry the entire mixture for about 30-60 seconds or until everything is well-coated in the sauce. Serve immediately–if you want, you can garnish individual servings with chopped cilantro, lime wedges, and black sesame seeds. Now this looks good! I’m going to print it off. Thanks! We love noodles and this looks really yummy! The black sesame seeds are a nice touch, do they taste different? Looks and sounds just so good. I love veggies with a little crunch to them when done but hubby hates them that way. And at 65 don’t think I will ever change him. Maybe I can do this and take mine out and cook his a bit more. Worth a try . This looks delicious…and healthy, too! Looks so good and colorful! And I’m really excited to see your finished kitchen! Sounds yummy and easy!! Thanks!! Girls do you have anyone with heart diease in your family..? The sodium level for a person per day is around 1500mg max. This stir fry recipe has 4114mg sodium in it so if you divide it by 4= 1027mg of sodium.The soy sauce alone for the 1/4 cup is 3594 of that…not healthy but more then likely tasty…sorry! Love Aloha Shoyu soy sauce!! it’s the only way to go. I know this is almost a year late, but I just want anyone who is reading the comments to realize that this is a false statement. My husband was recently put on a “low-sodium” diet, and he is supposed to have 1500-2000 mg of sodium each day. According to the USDA (http://www.choosemyplate.gov/food-groups/downloads/TenTips/DGTipsheet14SaltAndSodium.pdf) we should have 2300 mg of sodium per day or less UNLESS we have some specific health conditions. I think this is going into my menu for next week! Sounds and looks yummy! Sodium or not, I’ll be making this one! I’ve also made something similar with Ramen noodles – they are a close consistency with chow mein and low mein noodles. I just don’t use the flavor packets and only cook them for a couple of minutes. As for the sodium, since the majority of the people who read this blog and those who write this blog do not suffer from a certain disease, I think it’s reasonable to publish this recipe without disclaimers about it’s sodium content. Sheesh. I’ve never seen our best bites so saucy before. It’s new, its edgy…I like it. lol! Satan’s Swedish Storeroom. Now THAT is funny. Can’t wait to see the kitchen. I’m redoing my own in January! Yum! I’m making this tonight! Thank you for saving my family from taco bell or the likes. Four hour trip to ikes? You poor thing! So excited for you and your new kitchen!! Can you tell me the difference between DARK Sesame Seed Oil and regular? Thank you. Sally, really, you can use either, dark sesame oil just has a stronger flavor, so you can use less of it. So when I saved this one in my recipe box the picture was ice cream. How do I fix this? That will throw me off for sure when I am looking back through my recipes. Oh. My. Gosh. I want that in my belly right now! my go to is always enchiladas. quick, easy, uses things from the pantry and delicious! What a great giveaway! And congrats to you guys!!!!! My favorite is any that is easy, quick, and nutritious, with hopefully some leftovers for lunch! My go to recipes are chicken tostadas or tacos, sesame noodles and stroganoff. My favorite go to easy meals are Hawaiian haystacks or one of your pasta recipes from your cookbook. Why can’t I think of the exact name now? The “spaghetti” sauce as we call it with artichoke hearts, green onions, garlic, etc over ravioli. Yummmmmmm. Ooo I feel for you on the kitchen. When we were doing our kitchen, I was mistaken for being homeless! Here is hoping your kitchen is fabulous, I love how mine turned out and after a few months, the whole trauma of the remodel is a distant memory. This was YUMMY. I didn’t even put in the chicken. And I didn’t mind the zucchini (which I tend to avoid. At all costs). Your photographs are just gorgeous! And this recipe sounds like a real winner. Simple to make, delicious to eat. Thanks. I made this last night. It was delicious. Definitely will make it again!! Thanks Kate for another recipe that will now be in my monthly rotation! Mine didn’t look as beautiful as yours but my kids and husband LOVED it! I used Chow Mein noodles and will add brussel sprouts next time, along with chicken (since my husband, like yours, kept saying this would be amazing with chicken!) I was impressed how fast it was to cook something with an oriental flair. Normally Asian food takes forever to prep, I was done from start to finish in a half an hour–my kind of meal! Keep up the good work ladies! Made this for my family tonight and everyone LOVED it! Thanks for the recipe! Made this tonight for dinner! Delicious. Love that it’s full of vegetables and great flavors. Next time, I’ll try it with whole wheat pasta, see how we like it, but it’s a definite make-again recipe. Thanks! Yum! Made it tonight. I used ground ginger instead of fresh, and I felt like something was missing from the flavor…. Maybe that was it? But it really was good! Thanks again for a hit at my house! so, I just realized something….. The only ingredient I didn’t have was some zucchini and I made a special trip to the store just to get this, because I LOVE zucchini and makes these sort of dishes for me. And I just saw the zucchini sitting on the counter. I forgot to put it in!!! And I’ll bet that’s what was missing for me! lol! I’m probably going to feel embarrassed for saying this, but I’m not familiar with rice wine vinegar, and I couldn’t find it at the grocery store. Is it something that is usually hard to find? Can it be substituted with something else? And as if THAT weren’t embarrassing enough, I’ve never used fresh ginger before. Should I be buying ginger ROOT? Or is that something else? I have powdered ginger, but would that be nasty? If I can use powdered, what is the equivalent to 2 tbsp fresh? You should totally be embarrassed. JUST KIDDING!!! Don’t be embarrassed at ALL! You can just use rice vinegar or even just white wine vinegar or white vinegar. Oh that tutorial is FABULOUS! I don’t feel scared anymore. Thank you!! I am sure breaks cooking laws everywhere, but I love making this kind of noodle stir fry with ramen noodles. Something about the consistency of the noodles really picks up the flavor well. I made this with linguini as called for and my husband said he liked the ramen noodles much better. The seasonings were great on this recipe. I love the infinite variations of making this dish! I have been looking EVERYWHERE for these black sesame seeds. Of course, I’ve made this dish several times (a dinner staple) with the plain toasted sesame seeds but loved the look of your black sesame seeds so I’ve been on the hunt. Found them over the weekend at Williams Sonoma so I’ve got this one back on the list to make this week. Great color and flavor combination 🙂 Really good with added shrimp too!! Me and my husband had this for dinner last night and it was delicious! I wanted to make this ever since you posted it and finally got around to it last night. I do have one complaint though….when I tried finding the recipe in the recipe index I had some difficulty locating it. I couldn’t even find it when I looked in the alphabetical list. I think I was able to find it under the ethnicity button. My first instincts were to look under the “side dishes and vegetables” category and then the “pizza and pasta” category. So maybe you can put it in one of those locations??? If not, at least make sure it is in the alphabetical list! 🙂 Other than that, it was really good and I will definitely be making it again! This is also really close to the Whole Foods stir fry counter that I love!! But an hour drive away. Thanks for the great recipe! I posted a version of it on my blog and linked back to you. Made this tonite, and wow was it good. 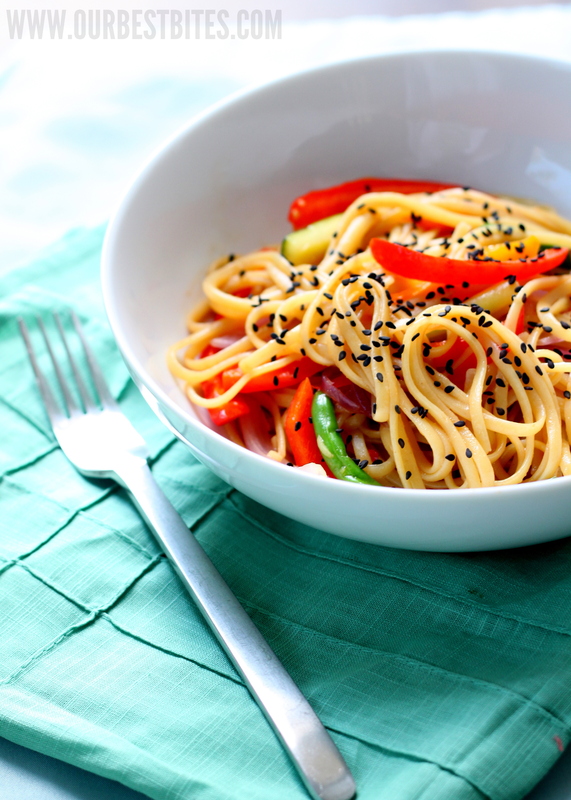 I was looking for asian noodle dish WITHOUT peanut butter, or tahini, and this was it. Yummmmmo. All the family loved it, and next time, going to add some shrimp or chicken to it for a one dish meal. Thank you so much. Maybe it’s just me, but I found this dish to be extraordinarily hot… I used Kikkoman Siriachi hot chili sauce, (but to be on the safe side added a couple T. of sugar to sweeten it up since I see your recipe calls for SWEET chili sauce. I’m a pretty novice cook!) Did I use the wrong sauce? Lol! Yes–sweet chili sauce is much more mild than sriracha. 1 teaspoon of sriracha in a recipe like this would be way too spicy for my taste. So sorry it was so hot! Hi Kate. This looks really similar to your “Veggies and noodles with Thai Coconut Curry Sauce” recipe, which I have made and enjoyed. Anyway, just wondering, in your opinion, which dish do you think has more flavor? I am going to make this one, but just for fun, wanted to know which one you like better? I guess it depends on if you’re in the mood for curry or not, right? Anyway, I always like to hear your opinions! 🙂 Thanks! I just made this for dinner and my normally picky 4 and 2 year olds devoured it. Thanks for the great recipe!